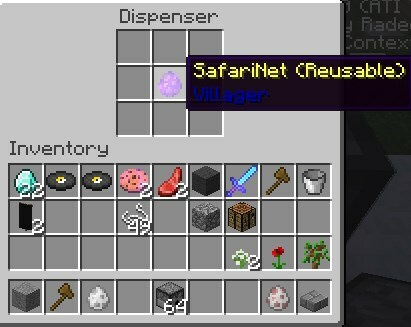 You can also use SafariNets in dispensers! ❯ Permit players to catch certain mobs. Must be enabled in config. ❯ Permit players to release certain mobs. Must be enabled in config. Please note that by buying this plugin you agree to the following! Only use it for your server/network! You will get Support if the plugin doesn't works for you, I am an very active author. Refunds: You are allowed to refund the transaction for any reason, but this must be in a time frame of max 7 days after purchase. -> You will get the whole amount back and the plugin will not work anymore after refund. You can blacklist mobs in the config.yml if you want to disable them for SafariNets or change the Display-Name + Lore. FOR 1.9, 1.10 and 1.11 USERS: Remeber that the Sound enum of bukkit changed in 1.9, for instance from "SLIME_WALK" to ENTITY_SLIME_WALK". -> You need to define/change this in the config when using 1.9. # Item with this displayname would turn in a safarinet. Nice to use in Essentials-kit. lore: "Right click on an entity%to catch it!" MStoneZ, AkenBii, ChitogePlayMc và 3 người khác thích điều này. The plugin that will make your server a better place for pvp! Alo ? Em ak ? Nhớ a ko ? Nhớ ak ? Premium Plugins Rune Stones - 40+ Runes!